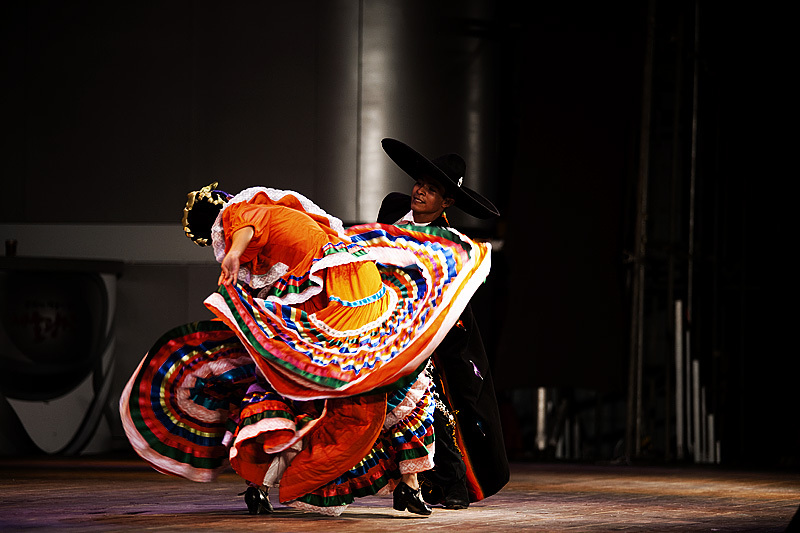 A couple performs a traditional Mexican dance on the stage at Seoul plaza in front of Seoul city hall. Dance troupes from various countries came to Korea to participate in a cultural dance exchange during the Encounters with World Cultures in Seoul. I'm gonna plead ignorance on this one. 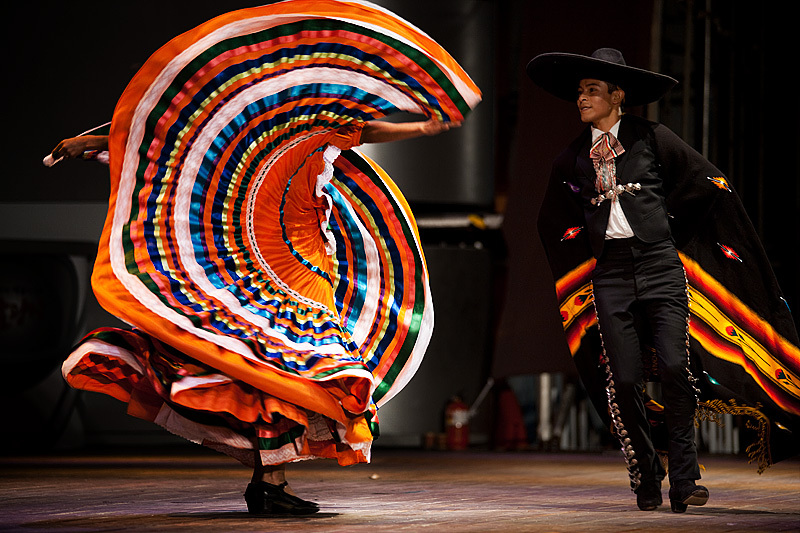 Having lived in California, I thought my knowledge of Mexican culture exceeded that of the average person (e.g. I watched "Y Tu Mama Tambien" three times!). 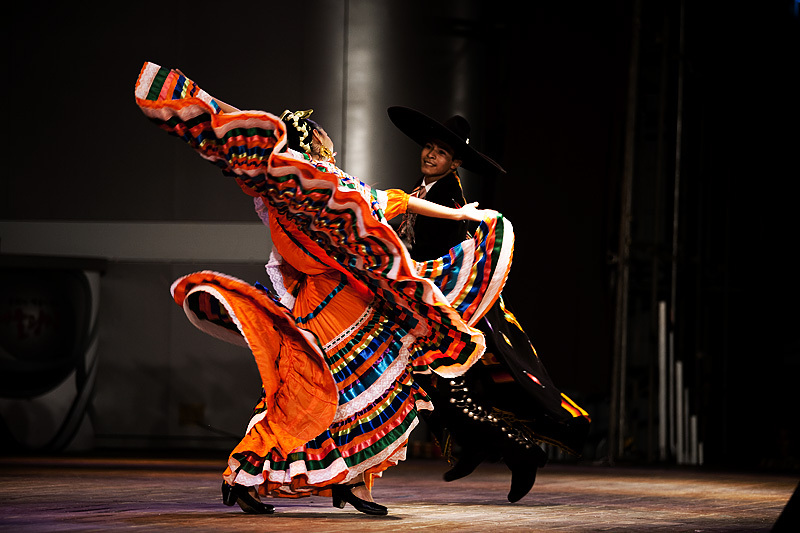 Yesterday I watched this traditional Mexican dance for the first time in my life and I know now my cultural knowledge doesn't extend beyond the ability to order a carne asada burrito in broken Spanish. "One burrito with carne estrada, por fayvor." 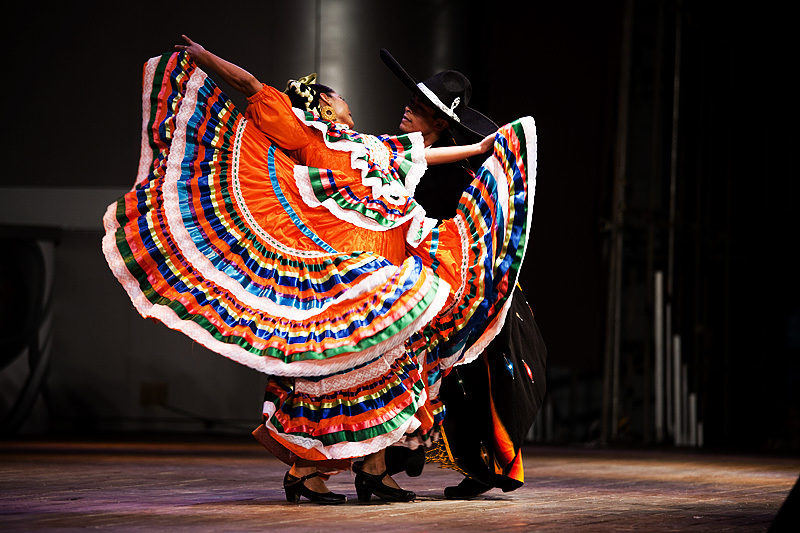 The dance, called baile folklorico was absolutely breathtaking!!! The female dancer constantly windmills her arms to create an uninterrupted flow of undulating color while striking spine bending positions that even Keanu Reeves (as Neo) would envy. The male dancer is merely a reference point in what is an incredible female performance. These images combined with my lackluster composition don't do the performance any justice. Video would've done the trick but I didn't have my video camera with me. Hopefully the results of the following Youtube search will give a better idea of the speed and style of dance. Search Youtube. 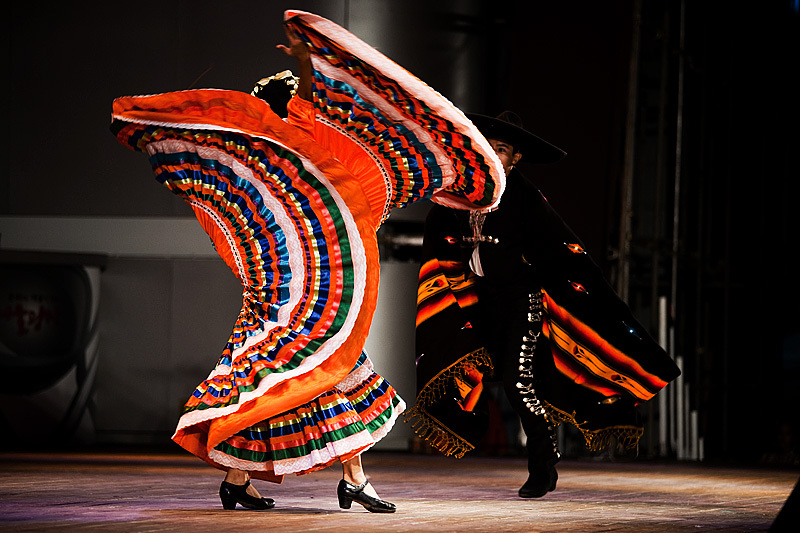 The arms of the female dancer create never-ending waves along the edge of the colorful dress. Curse the yellow, red, and orange stage lights. It made color correction incredibly complicated for these photos! Wow and ouch! In case the photo is unclear, the female performer's back is nearly parallel to the stage yet she continues to generate waves in her dress. Yeah, I find it interesting also that I come halfway across the globe to discover something new about my country's southern neighbor. Many many more photos of this evening's proceedings to come! Whoa -- nothing "lackluster" in the composition of these. That skirt is a-HUH-mazing! Is it selfish of me to want one? Cuz I want one.